Stanton, MI - The streak continues! For 24 years there hasn't been a repeat winner of the "Original 50 Grander" in Stanton, Michigan. The 25th year saw Chris Stine out of Silver Lake, Indiana defeat Bradenton, Florida's Troy Williams Jr. for the $50,000 Main Event victory on Saturday Night. 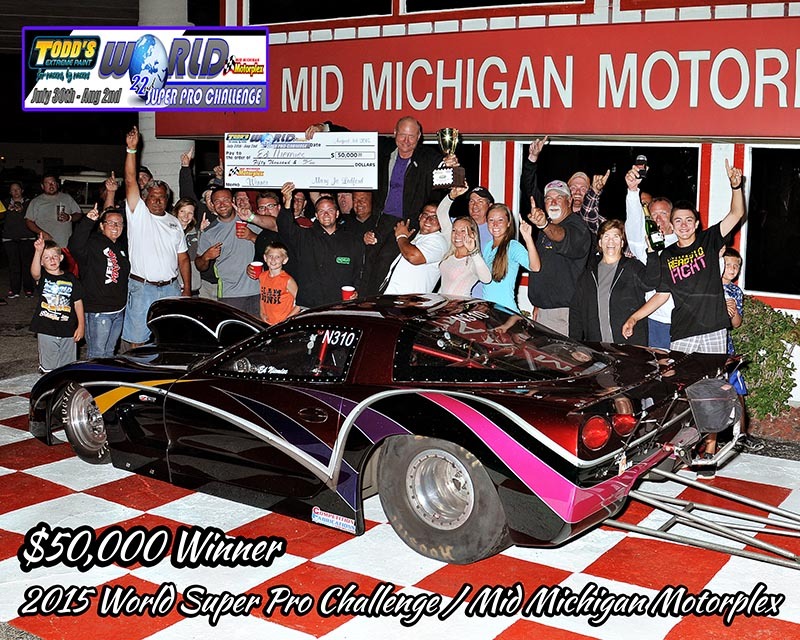 Stanton, MI - The 25th Annual World Super Pro Challenge kicks off Wednesday evening with a test-n-tune from 4:30 - 9:30. Live coverage of the event begins Thursday morning exclusively here on DRR. Watch big money bracket racing all weekend long including Saturday's featured $50 Grander! 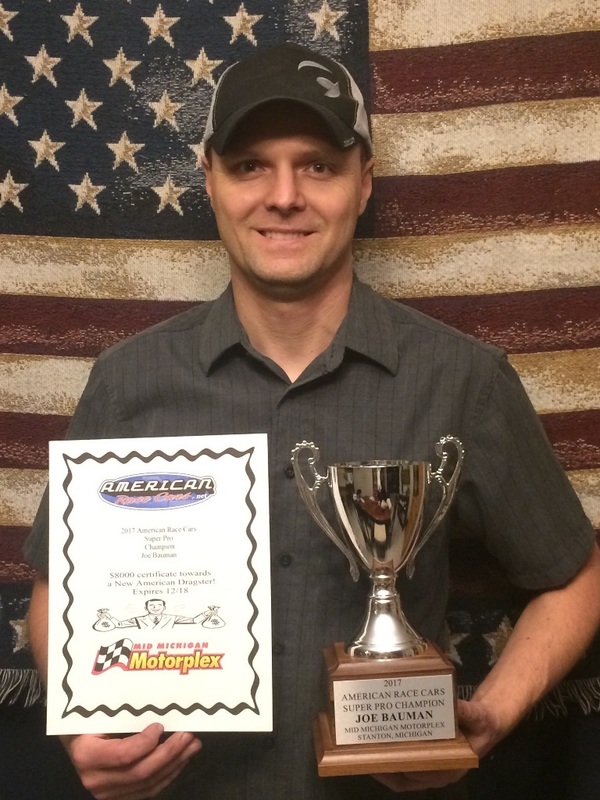 Pemberville, OH - During the 2017 Awards Banquet at Mid Michigan Motorplex, a series of awards and presentations were given out to the racers. 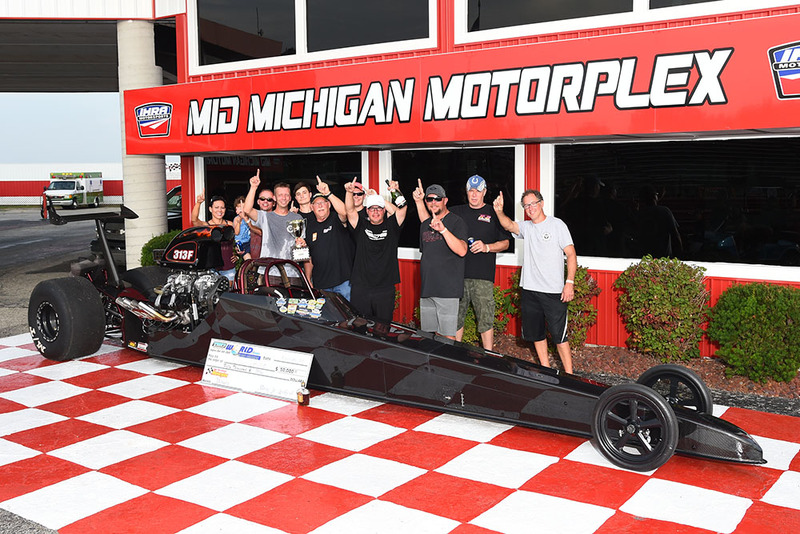 The Super Pro Championship was won by Joe Bauman, in which he received a handsome credit towards a new 2018 dragster chassis from American Race Cars. Stanton, MI - Mid Michigan Motorplex will return to IHRA Sanctioning in 2018. We believe this will put some excitement back into our weekly bracket program. 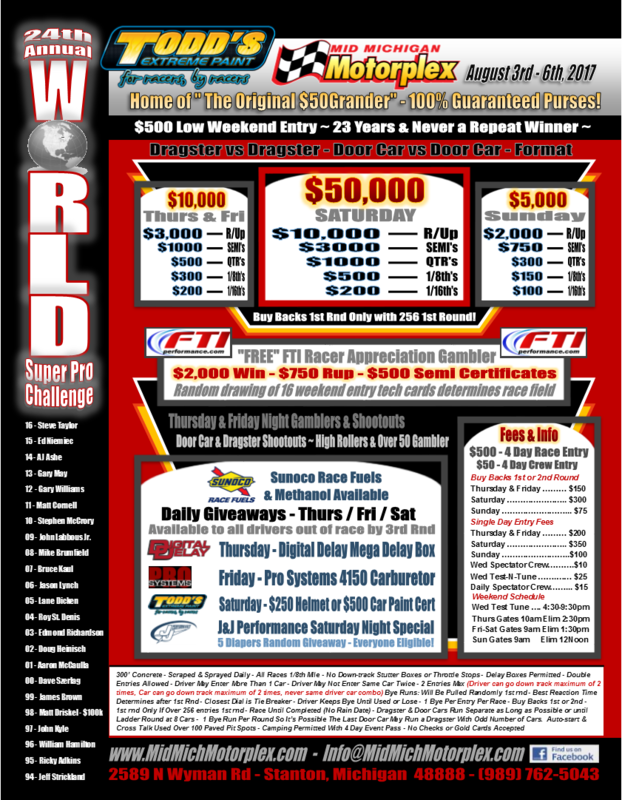 Stanton, MI - The 24th Annual World Super Pro Challenge presented by Todd's Extreme Paint showcases the "Original $50 Grander". Racing action starts Thursday August 3rd and runs through Sunday the 6th. Never a repeat winner in 23 years, the "Iconic" Event brings Big Money Bracket Racing to the North. 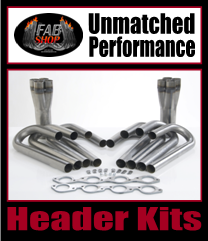 CLICK HERE for Live Racing Action! 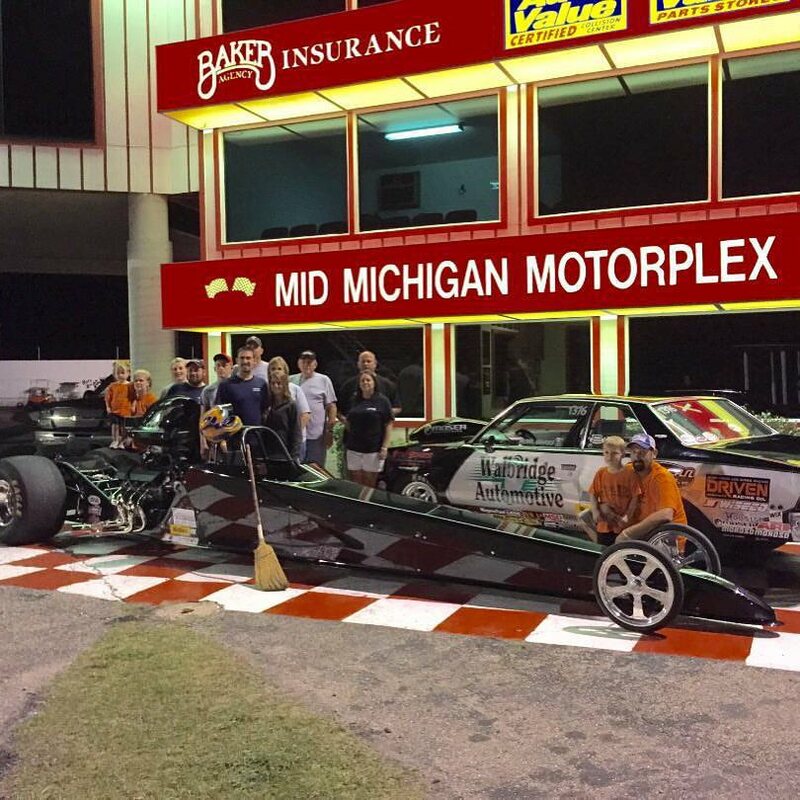 Stanton, MI - The 2016 World Super Pro Challenge presented by Todd's Extreme Paint once again showcased great racing action, a very family oriented event and beautiful race cars! Stanton, MI - Thursday kicks of The World Super Pro Challenge. The Original $50 Grander with all purses 100% Guaranteed draws the nations top bracket racers in search of the coveted title. Todd's Extreme Paint once again presents the 23rd annual event. CLICK HERE for Live Video Coverage. 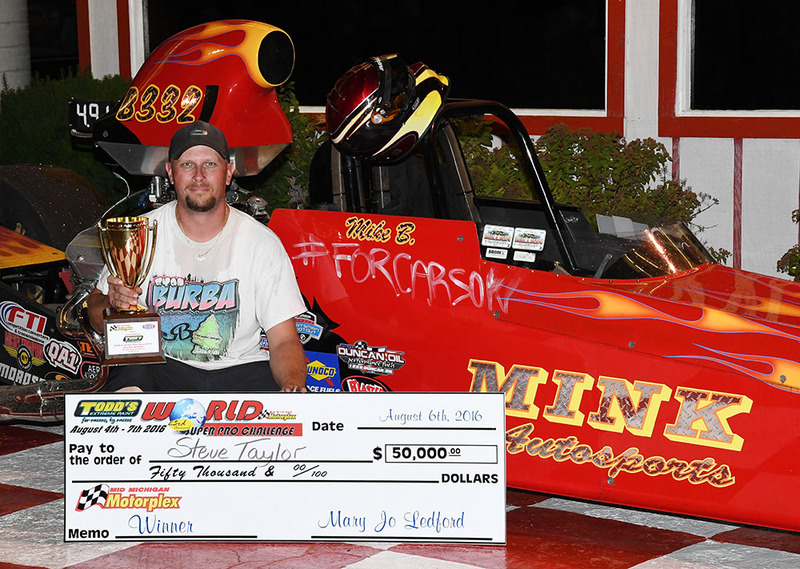 Stanton, MI - Ed Niemiec from Illinois ousted over 240 of the Nation's best Big Bucks Bracket Racers to take the $50,000 Big Check on Saturday Night defeating "Red Hot" Indiana Racer Wes May in an all door car final round. 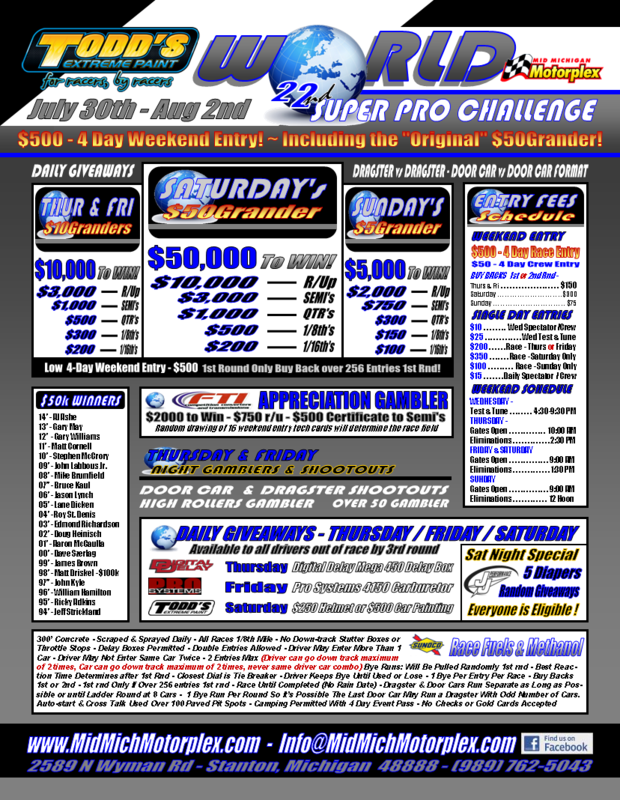 Stanton, MI - Thursday kicks of The World Super Pro Challenge. 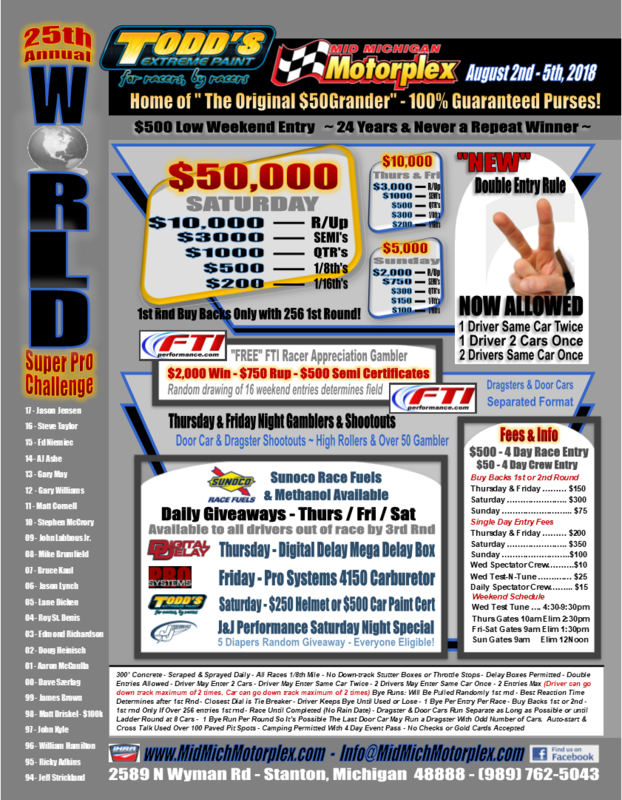 The Original $50 Grander with all purses 100% Guaranteed draws the nations top bracket racers in search of the coveted title. CLICK HERE for Live Video Coverage all weekend long.